Each week, a dozen Vigets collaborate to generate the Lab Report, a long-held tradition that informs, connects, and motivates our team. It is shared with the entire staff every Friday afternoon and, while it takes a substantial coordinated effort to pull it off, the value is well worth the investment. Here’s why. In the early years, our CEO wrote the entire newsletter each week. 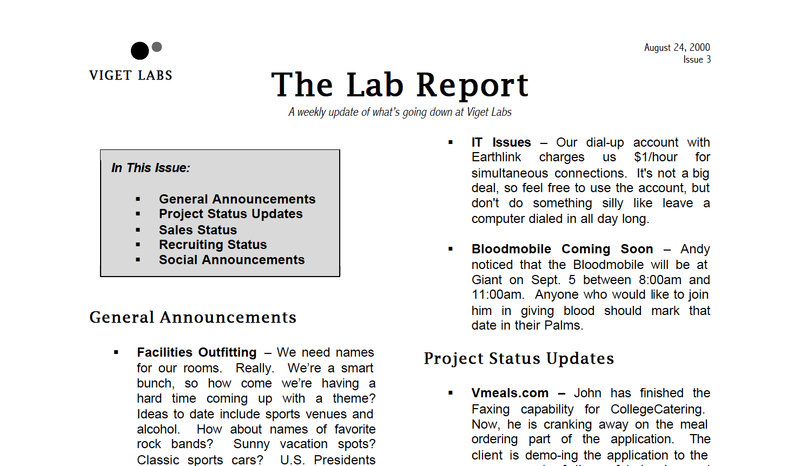 To this day, he still contributes each week and does a final review of each issue before “publication.” Since May 2007, we have created the Lab Report each week in a Google Doc Template, which our Office Manager maintains. She shares a clean copy each Thursday with a large number of contributors, including project managers, the business development team, directors, and some folks from the analytics team. All contributions must be added by Friday at 10:00 a.m. EST. Then, the report is edited, reviewed, and finally shared with the entire staff as a comments-only Google Doc in the afternoon. The Lab Report then serves as the loose agenda for the weekly all-hands staff meeting we call Free Lunch Friday (actually Free Brunch Friday here in the Boulder office). FLF is more like The Daily Show than a normal staff meeting; but, that’s a story for another blog post. Providing social reward to team members, such as kudos to staff for stellar project work or highlighting new blog posts, helps motivate people. When you celebrate an activity or achievement, it reveals the company’s values and strengthens that understanding across the team. Sharpening the saw or continuous improvement is an easy idea to talk about adopting, but hard to execute well in practice. We consistently do retrospectives after each project we complete and document the team feedback. This is shared back to our directors and business development team, but then is also shared with everyone via the Lab Report. This allows everyone to take advantage of lessons we uncover through previous projects. Compelling work is a huge motivator for our team and, while we share sales updates in our weekly all-company meeting, we also document them in the Lab Report. We encourage everyone to read the updates and, if they are excited about or have insight into the opportunity, to let us know. This allows us to better match people’s interests with work and to ultimately create higher-quality, more inspired work for clients. This approach may influence why Viget turnover is low. We’re always looking to improve our Lab Report to ensure high readership, and we love hearing about other approaches to keeping a busy, distributed staff in the loop. Group chat tools like Slack, which we use, are great for this -- but there’s just something about a weekly summary to tie it all together. Do other companies have a Lab Report? I've heard of at least one company where the CEO records a voice message daily that gets emailed to every staff person. While not a weekly newsletter, that could be an effective way to keep everyone up to date. If your company creates a regular digest, I’d love to hear about it. In addition to our Lab Report, we've also recently revamped our external weekly email newsletter, which you should be sure to check out.